Which is more unhealthy: A Donut or a Cigarette? Guess again. Obesity related illnesses have surpassed cigarettes as a cause of death. 3 donuts a day is far worse than 3 cigs a day. Problem is that cigs affect others. Donuts don't. I agree obesity leads but societal effects to those around you = cigs wins. I am a health nut & eat well, don't smoke, have red wine, workout daily & AVOID smokes like the plague. I will run away from a lit cig -- even if a best friend lights up. I suggest all do this. Ban all cigs in ALL public areas/apts, etc. & we will see huge drops in heart, cancers, etc. No way to control the chow one ingests, other than warn them & when they get diabetes, then let them know how they should have tried harder to avoid this. Health is wealth, & cigs & donuts devalue that health. And drunk drivers kill people. And wide receivers drop passes. And people get mosquito bites. Charles, I'm only trying to say that cigs are worse due to further invasion to not only one's health but doubly problematic to other's health as well. I understand, it's just that the side comments can throw a thread off the tracks. I agree with this. But, the original post was for fun - you're right, unless someone posts some hard data (which I don't think would be hard to produce - and I think the data would show the donuts to be much unhealthier), this is all speculation - but, it's for fun and I think it will get people to think outside the box too. 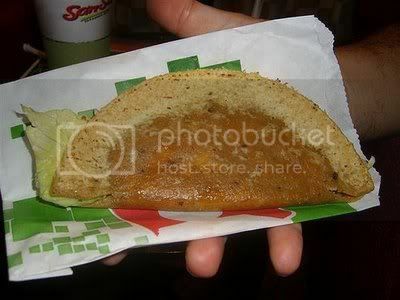 If it makes anyone feel any better, I just had a Jack in the Box Taco for breakfast. Cold. From Sunday. My work colleagues almost fainted. the most unhealthy thing is not having enough self control to control what you put in your body.